If our fascination with civilisation’s ruins is hardly new as a subject for art (witness Ruin Lust currently at Tate Britain), John Wilkinson’s exhibition We are not in the least afraid of ruins presents an unusually political and contemporary vision of ruins in a post industrial landscape. Based in Sheffield, Wilkinson draws his inspiration from the city and the landscape that surrounds it: the moors and rocks, iron ore and coal that shaped Sheffield’s industrial past; the abandoned remains of that industry littering the city, being gradually replaced by the shiny and ultimately faceless constructions of the finance led economy. 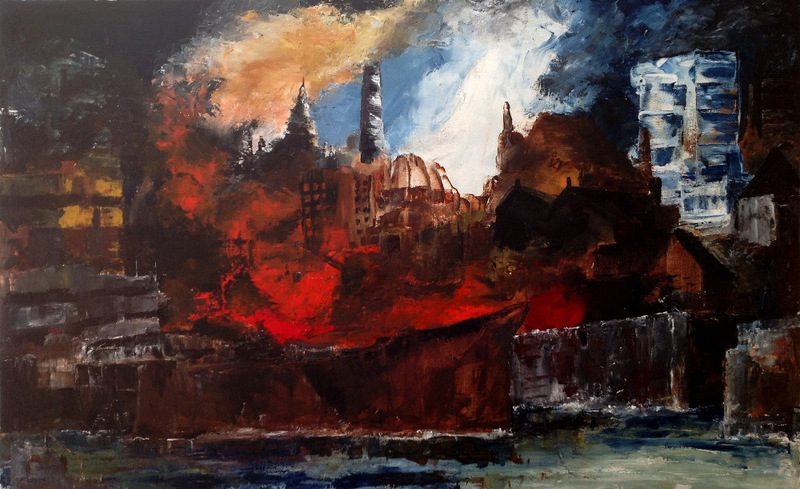 His landscapes are semi-abstract imaginary compositions, but the Sheffield references are perhaps most obvious in paintings such as In the shadow of giants, where the mining winding gear and wagons brimming with coal are abandoned in favour of the distant glass towers; Dislocated, with its rusty girders, trademark sulphurous sky and pools of contaminated water; Watching the forge fires fade, where the grey city seems to tumble in on itself under the shadow of a great smoky bird rising from the blood-red fires; and The Price of Coal, where insubstantial railway lines are sketched across the layers of blood and mud and rock it took to make them. Cheek by Jowl with History, on the other hand, references Northwich, current home to the exhibition, with its half-timbered houses squeezed between the rusting hulk of a boat and the sprawl of chemical factories. But location is subsumed in these paintings to an often cataclysmic vision of our instinct to destroy. Wilkinson cites the Victorian painter John Martin as his earliest influence, and this can be seen in paintings such as The threat of encroaching modernity, where the old of a London-like city is ablaze and even the glass towers of the new seem vulnerable; and in the post-apocalyptic muted blues and browns of The end of all things, the largest painting of the exhibition. In the eponymous We are not in the least afraid of ruins the apocalypse is abstracted to a seething mass of fiery destruction with the structures of the new reduced to the thinnest tilting white outlines with the merest hints of people lurking in the shadows of the inferno. 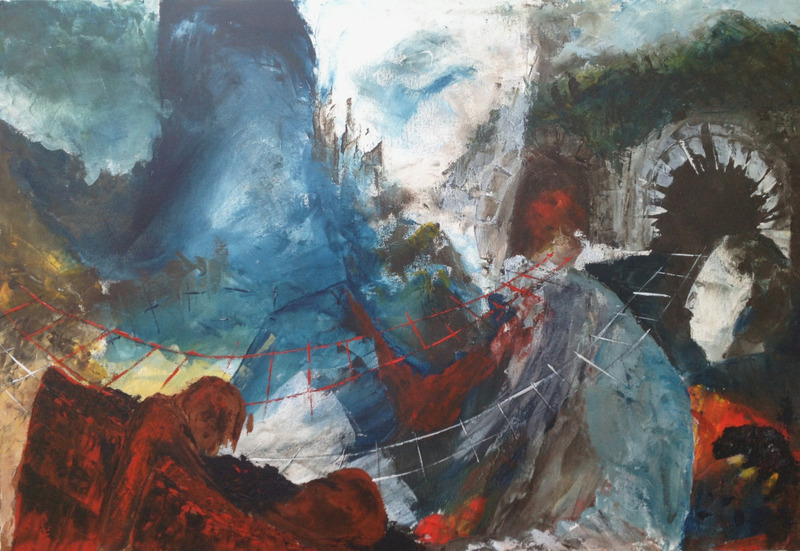 People are absent in many of the paintings, enhancing the sense of the powerlessness of the individual against the inexorable forces of destruction and change. Wilkinson does, however, pay homage to the largely forgotten workers who created the industrial landscapes that are now being destroyed. They are present in foreground of The Price of Coal, moulded, it seems, from the clay they dug to form the railway tunnel, and the blood of their sacrificed lives. And they emerge as mute observers from the sooty waste of their creation in Watching the forge fires fade. As the creators of our industrial landscape are ground into dust, it is the stick-like people in paintings such as Into the light and Keep Calm and Keep Shopping who are perhaps held at least partially responsible. Here are the mindless drones drawn to the blinding light of the false Mecca of consumerism, oblivious to the sliding collapsing structures around them. 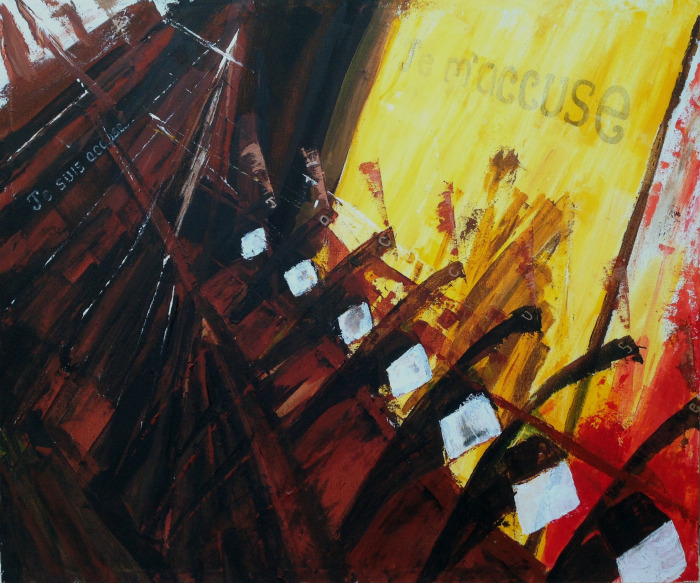 In We are all guilty the people line up with their blank screen heads and their mechanised fists raised to spell out their bleak message of being both the accuser and accused. No one, it seems, will take responsibility. If his message gives little cause for optimism, Wilkinson’s use of colour can seem sombre and subdued, particularly in the more impressionistic landscapes, taking his palette, as he says, from the colours of the moors, stones and skies surrounding Sheffield. But this is balanced with many pieces that glow with vibrant colour and light. From The imposition of conformity, where the reds and ochres of the factory stacks morph into the flash-lit glass of Gherkin-like constructions; through Into the light, where the red and orange outlines of the people and the insubstantial structures shine jewel-like against the indigo sky, reflecting in the slippery ground; through the blaze of vermilion in The threat of encroaching modernity and Watching the forge fires fade; reaching its climax in the almost celebratory abstract Teetering on the edge where the textured vertical structures melt in a sublime inferno of red, framed by the flat deep blue sky. Wilkinson also uses colour symbolically, exploring the meaning behind the red white and blue of national flags in The Making; reducing the coal mine to a violent contrast of vermilion and ultramarine in Industrial Relations. And in Technicolour nightmare and The torn wallpaper of childhood, the faded tones of the past are viewed through transparencies of the red, yellow and blue of today’s mainstream political spectrum. Wilkinson promotes the concept of Slow Art in this exhibition: the idea of art that is worth taking time over in this world of constantly changing and throwaway images. And while you can view most of the work online via his website, these are paintings that reward being seen in the flesh. They are paintings you can take a walk in, finding new shapes and images with every viewing. And John will generally be there to guide you should you wish; telling you the stories behind the paintings and welcoming whatever feedback you may choose to give. This exhibition is not for lovers of the pretty or happy-go-lucky, but it provides much that is thought provoking while giving the eye plenty to appreciate. Exhibition runs till 15th March. 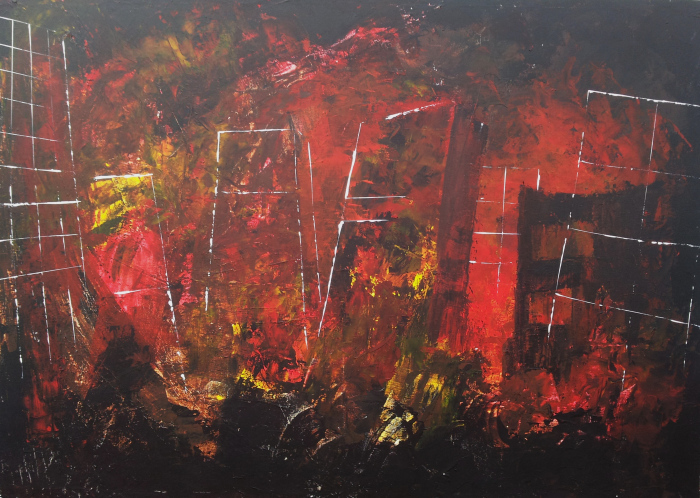 This entry was posted in Art and tagged Abstract art, Art exhibition reviews, Art exhibitions, Contemporary art, Industrial art, Northwich, Painting, Ruins.